Were you looking for the Light of Sanghelios, also known as Honor Guard Ultras, or the Warzone boss Elite Ultras? "On the blood of our fathers. On the blood of our sons." Ultra, also known as Evocatus (plural Evocati), is the highest regular rank among the Covenant's Sangheili warriors. While most Ultras are more warriors than leaders, specially appointed members of the class known as Evocati Delegatus take on a role analogous to high-ranking field officers. Sangheili Ultras are extremely skilled veteran Sangheili warriors who have not pursued a career of leadership, instead focusing solely on combat; this is in contrast to the Majors or Obedientaries, who served as the Covenant's primary field officer class. The rank of Ultra is considered a great honor both among the Sangheili and within the former Covenant, which stored records of their exploits in the record vaults of High Charity. Not many Sangheili remain as Ultras for long; typically, such Sangheili are expected to ascend to posts such as that of a seneschal, enter a career in politics as a Councilor, or return to their ministry to serve as instructors. Ultras are sometimes deployed on high-priority missions, often alone. While they most often engage in open battle, Ultras are known to command Type-47A Scarab assault platforms. Ultras attached to Covenant armies rarely answered to their warhost's commander, but in practice, they were nevertheless expected to exhibit a certain degree of cooperation. To accomplish this, Ultras elected special representatives known as Delegatus from among their ranks, who would swear binding oaths to obey their warhost commander's orders until all of their objectives were completed. While these Ultra "officers" were not officially leaders within the Covenant chain of command, their expertise and authority was universally recognized among Covenant troops. This role is essentially analogous to UNSC Warrant Officers. Ultras wear pearlescent armor with higher-than-average shield strength. They sometimes wear unique armor with red markings and a crested helmet similar to that of the Sangheili Councilors. Other Ultras may opt to wear (or are issued) a white version of the standard combat harness or Storm harness. In combat Ultras typically wield plasma rifles, though they also commonly use plasma repeaters and concussion rifles. Ultras often use energy swords in close combat. Description: On the blood of our fathers. On the blood of our sons. Evocatus was a veteran military rank in the ancient Roman army, which parallels the Ultras' station in the Covenant. As with other instances of such terminology, "Evocatus" is an English approximation of the original title used by the Covenant. In Halo 2 and Halo: Reach, all Sangheili encountered become Ultras when the Thunderstorm skull is activated. In the level "Floodgate" in Halo 3, the corpses of the Ultras in the crashed cruiser can be infected by the Flood. They will sometimes pick up dropped energy swords lying on the ground. This may seem alarming, but the Flood apparently either do not have animations for the energy sword or are simply not programmed to use it, because they will simply follow the player without attacking. They retain the white-colored armor of the corpses, making them look very distinct from other Flood forms. In Halo: Reach, Ultras, despite being a regular rank, is listed as "Elite Specialist" in the post-game Carnage reports. In Halo: Reach multiplayer, the Ultra combat harness is made available after the player reaches the rank of Warrant Officer. A render of the Sangheili Ultra wearing a standard combat harness in Halo 2. A Sangheili Ultra wielding a Type-51 Carbine on Installation 05. A Sangheili Ultra wielding a Type-33 fuel rod gun. A Sangheili Ultra wielding a plasma rifle in his left hand and an energy sword in his right hand in Deliver Hope. A Sangheili Ultra with a concussion rifle in Halo: Reach. A Sangheili Ultra wielding a pair of plasma rifles. Render of a Sangheili Ultra in Halo 2: Anniversary. A Sangheili Ultra fighting Spartan John-117 onboard Cairo Station in Halo 2: Anniversary. A Sangheili Ultra wielding an energy sword on High Charity. 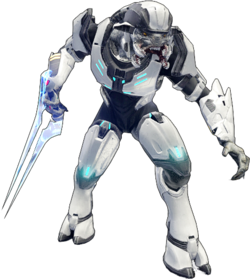 A Sangheili Ultra wielding a Type-51 carbine. A Sangheili Ultra with a Type-33 fuel rod gun. Sangheili Ultras in Halo: Ground Command. A Sangheili Ultra during the Fall of Reach in Halo Mythos. A Sangheili Ultra is killed by Fred-104 during the Battle of Alpha Corvi II in Halo: Collateral Damage.